The collection of toll at all plazas on National Highways will resume midnight onwards after getting adequate number of swipe machine for making payments. The Consumer Affairs Department has declared that there can’t be two maximum retail prices for the same item within a state which means all packaged items can’t be sold at two different MRPs in shops, multiplexes or airports. There would be no seizure of gold jewellery and ornaments up till 500 gms per married woman, 250 gms per unmarried women and 100 gm per male member of the family. Also, jewellery/gold purchased out of disclosed income won’t be chargeable to tax. The Central Government has told Supreme Court that its demonetization decision did not violate the fundamental rights of the people as these were simply reasonable restrictions for a bigger goal of eradicating black money. The Allahabad High Court has rejected the plea of a live-in couple that they should be provided protection as well. In this case, the woman happened to be already married so the High Court declared that this was an adulterous relationship between the partners. CRISIL has decreased India’s GDP growth forecast by 100 basis points to 6.9% from 7.9%. CRISIL’s full form is Credit Rating Information Services of India Limited. Board of School Education Haryana has made it mandatory for students of Class 10 and 12 to have Aadhaar card for applying to the 2017 examination. India’s annual coal requirement for current year has been estimated to be 884.87 million tonnes. This was presented by the Coal Minister Piyush Goyal in Lok Sabha. Persons afflicted with Parkinson’s disease and acid attack survivors will be considered disabled under the Persons with Disabilities Bill which is going to be tabled in the Parliament. People falling under the 21 infirmities will be given affirmative action and benefits. ISRO has started work on Chandrayaan-2 which will comprise of an Orbiter, Lander and Rover. It will tentatively be launched in the first quarter of 2018. India has declined to take part in bilateral talks with Pakistan on the sidelines of Heart of Asia Summit. This was declared by the MEA spokesperson Vikas Swarup. The Heart of Asia Summit this year is taking place in Amritsar from 3-4 December. Afghanistan is the permanent chair and India is the co-chair. The Heart of Asia-Istanbul Process was founded in 2011 in Istanbul, Turkey. USA Democratic party nominee Hillary Clinton’s popular lead has further surpassed President-elect Donald Trump’s vote tally. She has won 48.1% vote so fare while Trump has won 46.4%. However Trump has already won the Election by getting 306 Electoral college votes to Clinton’s 232. This was the 58th Presidential Elections in the history of United States. 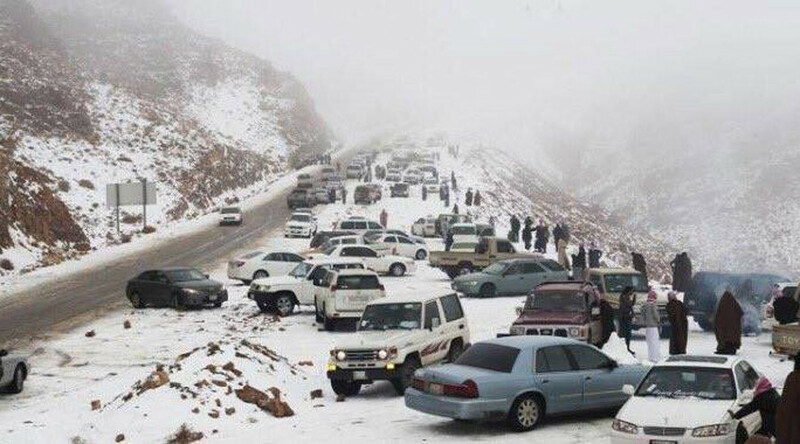 The deserts in Saudi Arabia were covered in snow after temperatures dropped to -3 degrees Celsius despite it being the rainy season there. Saudi Arabia is known as the birthplace of Islam and its king is Salman bin Abdulaziz Al Saud. 1. President-elect Donald Trump won how many Electoral college seats to win the election? 2. What is CRISIL’s new prediction for India’s GDP growth? 3. How much gold can a male member of a family keep without it getting seized? 4. Which country was shockingly covered in snow recently even though it’s the season of rainfall there? 5. Who is the Coal Minister of India? 6. ISRO is making which mission’s successor to be launched in 2018? 7. How many infirmities are covered in the Persons with Disabilities Bill? I have a doubt….could anyone clarify it?? But women cannot be charged for adultery. @Raksha Well,it says “that the HC declared that this was an adulterous relationship between the partners” so that means that she’s having an extramarital affair. Had she got a divorce from her current living Husband then she may have been granted the protection. But The husband will be charged and so will her “live in relationship partner” for commission of adultery. Thus, to answer your question, yes, she will not be charged. Anyone else can go challenge this judgement saying “equality before law” and that one cannot discriminate b/w the sexes. I don’t know how correct I am, but I hope you got the point.